An extremely difficult move to learn and perform, this method of switching the dice is only used by expert dice mechanics. A cheat will have to spend years practicing The Palm Switch if he is going to use it in a game without being noticed. The technique involves holding two pairs of dice in the hand and swapping them over at will when the crooked dice are needed, all with the fingers of one hand. One set of dice are palmed in the hand as you can see in Fig. 2. The cheat then reaches out for the other set of dice and takes them up with the ends of their fingers as can be seen in Fig. 1.. 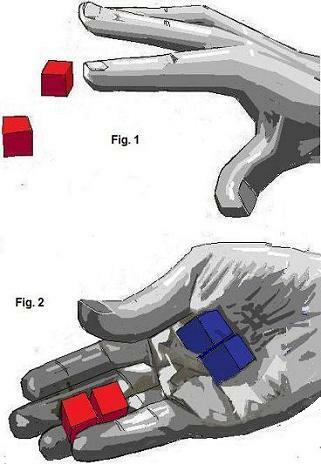 Fig 2. shows both the palmed dice and the dice held in the cheat's fingers. The dice are manoeuvred in the hand so the two pairs exchange places from the palm to the fingers and from the fingers to the palm. It is an incredibly hard thing to do with one hand. The dice held by the cheat's fingers are then thrown out while the other set is palmed away out of sight. This move is hard to spot, but you may get a clue it's being used if you study the cheat picking up the dice and notice that his hand seems to look a bit awkward.